Sometimes you need to share one single asset with your external collaborators. For these purposes, you don't have to create a website. A simpler and more straightforward is single asset sharing. Open an asset that you want to share with somebody. Scroll down the Infopanel and find Share option. 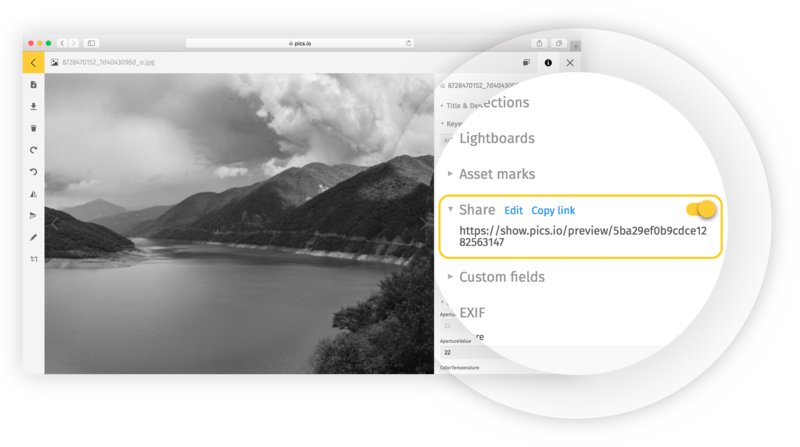 A simple switch of the slider will generate a link that you can copy and distribute in any way you like. How can I customize single asset sharing? allow others to see Thumbnail details (flags, star rating, color labels).